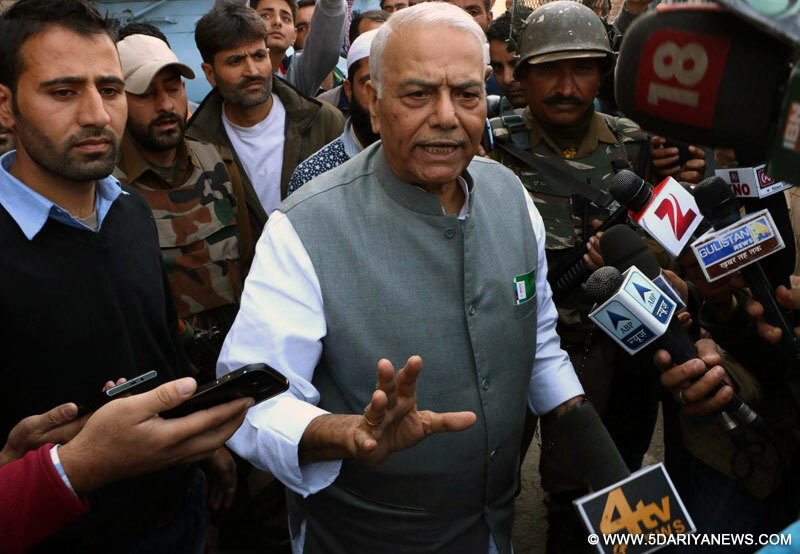 A five-member team led by senior BJP leader Yashwant Sinha on Tuesday met separatist leaders Syed Ali Shah Geelani and Mirwaiz Umar Farooq here with a view to break a logjam after over three months of deadly unrest in the Kashmir Valley.The team, which includes former bureaucrat Wajahat Habibullah, who has served in Jammu and Kashmir, ex-Air Vice Marshal Kapil Kak, journalist Bharat Bhushan and activist Sushobha Barve, landed in Srinagar and drove to Geelani's residence in Hyderpora.The delegation members made it clear that they did not represent the government and were visiting the Kashmir Valley on their own initiative.Geelani, who heads the hardline faction of the separatist Hurriyat Conference, agreed to meet and talk to the delegation.The octogenarian separatist had on September 4 shut the door on Marxist leader Sitaram Yechury and three other non-BJP MPs who were part of an all-party delegation on a visit to Kashmir. "Our objective was to meet and interact and that objective has been achieved. The talks were held in cordial atmosphere," Sinha told reporters outside Geelani's highly fortified house where he has been kept under detention for over three months.Sinha and his team members later went to meet Mirwaiz Umar Farooq at his Nigeen house, a day after the moderate separatist was freed from a guest-house-turned-jail in Srinagar and has now been detained at his residence. They are also expected to meet other separatist leaders, including Jammu and Kashmir Liberation Front leader Yaseen Malik who was moved from jail to a Srinagar hospital after his health deteriorated. Sinha said they were visiting the valley purely on a humanitarian basis and their trip should not be seen as a government effort to break ice with the separatist leaders, who have been spearheading the agitation since the July 8 killing of Hizbul Mujahideen commander Burhan Wani. "Our motto is to share the grievances and pain (of Kashmiri people). I hope the state of unrest will be resolved soon," the former BJP minister said, adding that they were "not here as a part of any delegation".Habibullah said the team didn't represent any government or political party. "Ours is a purely personal initiative to identify with the sufferings of the people here. "Bhushan, a veteran journalist and editor of multimedia Catch News, refused to divulge details of the meetings. "Sorry, I cannot talk," Bhushan told IANS.The Bharatiya Janata Party (BJP) distanced itself from Sinha's visit, saying it was being done by the individuals in their personal capacities. "It is not a BJP delegation. The BJP has nothing to do with this," party national secretary Shrikant Sharma told reporters in New Delhi. Habibullah, Kak and Bharve from the Sinha-led team have long Kashmir connections.Bharve has for years closely worked with young Kashmir men and women researching on social issues.Habibullah served in Kashmir during the peak years of militancy till 1993 when he was seriously injured in a car crash. He had been negotiating with militants occupying the Hazratbal shrine in Kashmir before the accident.Kak, a Kashmiri Pandit, is associated with a charity, Healing Kashmir. The fresh bid to break ice between separatist groups and the government comes after 108 days of unrest and shutdown that have hit normal life in the Kashmir Valley since Burhan Wani's killing.At least 92 persons were killed and over 12,000 injured in clashes between protesters and security forces. Police have arrested over 7,000 suspected ring leaders of stone throwers. Some have been let off.Sinha and his team are also expected to meet civil society and trade groups including the Kashmir Economic Alliance and the Kashmir Centre for Social and Developmental Studies. They will call on Chief Minister Mehbooba Mufti and Governor N.N. Vohra.